It's the ultimate work-out, especially if you like climbing stairs. It certainly beats a couple of hours inside a boring gym! To reach the start of the Skyline Trail, climb 800 steps from the parking lot, past the Chimney (2,280 feet elevation) and on to Exclamation Point (2,480 feet elevation). 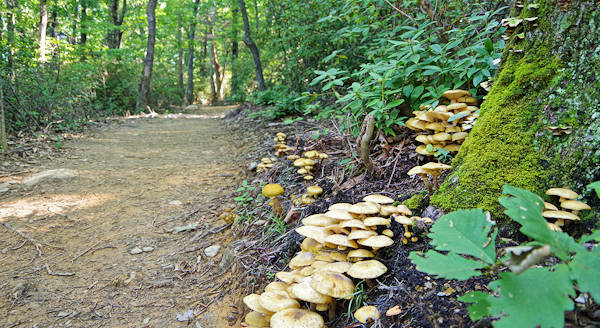 From there, the Skyline Trail is mostly wooded with several uphill sections - but not overly strenuous. The trek to the trail has much to see. From the parking area, head to the Outcroppings Trail, a network of super scenic staircases with 500 steps up to the Chimney. Take your time and enjoy the views and amazing rock formations along the way. 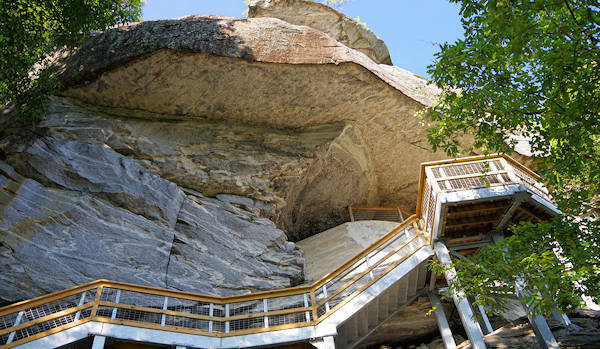 On your way up, take a short detour to squeeze through the Subway and climb Pulpit Rock (reopened in 2015). 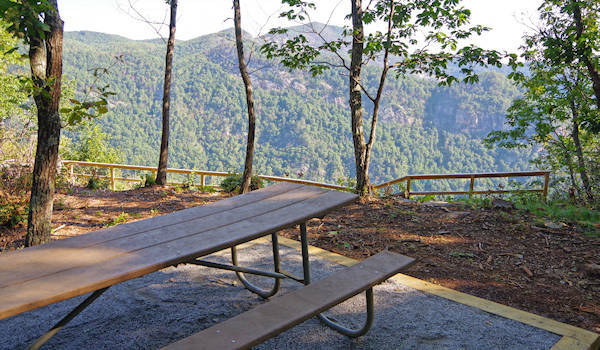 On your way back, take the more direct route via Vista Rock overlooking Lake Lure. 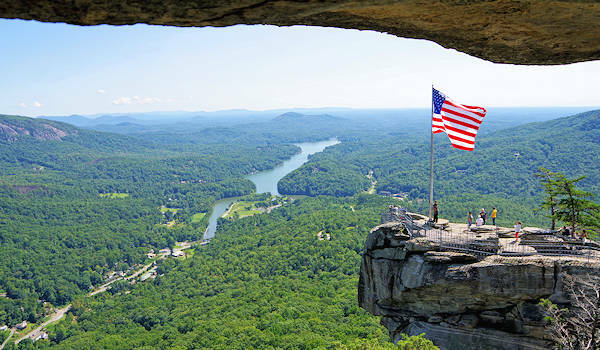 Of course, a must stop is the top of Chimney Rock. After descending the steps from atop the Chimney, you'll immediately see the staircase for the Exclamation Point Trail. 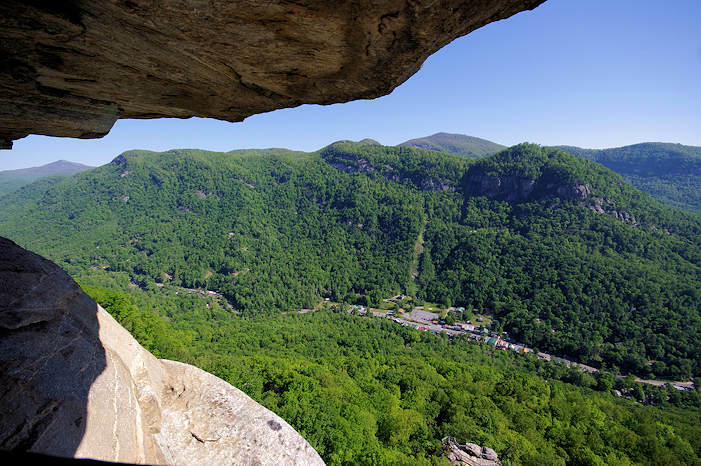 Along this trail, stop to see our favorite view of the 535-million-year-old Chimney from the Opera Box (pic above) and find the Devil's Head on the cliff. From the Chimney, it's only about 1/3 of a mile up to Exclamation Point (pic above) - but much of it is stairs! 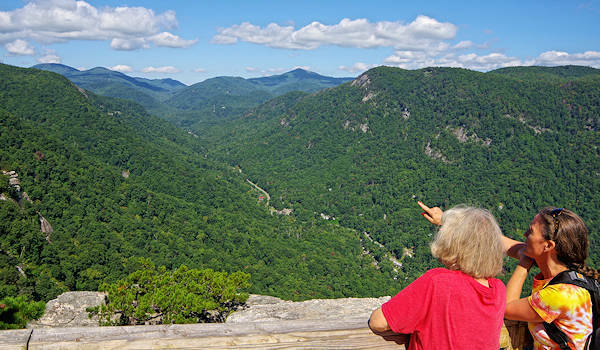 Look up the Hickory Nut Gorge to many peaks identified by a display sign. At this point, you are 1,400 feet higher in elevation than the village below. From the panoramic view at Exclamation Point, continue up the rock face a short distance to the beginning of the Skyline Trail. Good news, no more stairs! The trail is wide with a gradual grade. So the uphill sections are more gentle. About a half mile on the Skyline Trail is Peregrine's Point with the spectacular vista at the very top of this page and picnic tables. It's a great place to rest and enjoy some snacks or lunch. Watch the hawks or maybe even a Peregrine falcon riding the thermals in front of you. The trail continues another half mile to the top of Hickory Nut Falls with views of the cascades above the falls. But there is no view here of the 404-foot Hickory Nut Falls. 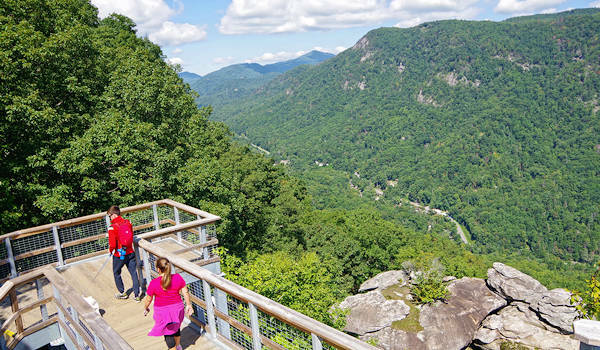 For a much easier hike, take the trail to base of Hickory Nut Falls. All the trails are dog-friendly, just keep them on a leash. The entire hike from the parking area is about 3.5 miles roundtrip. Allow 2-3 hours, with additional time to enjoy the many viewpoints along the way. It's strenuous, so take water and wear good hiking shoes. 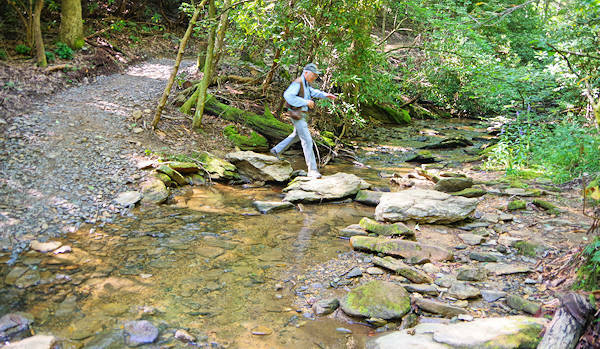 On hot days, hike early to beat the heat. 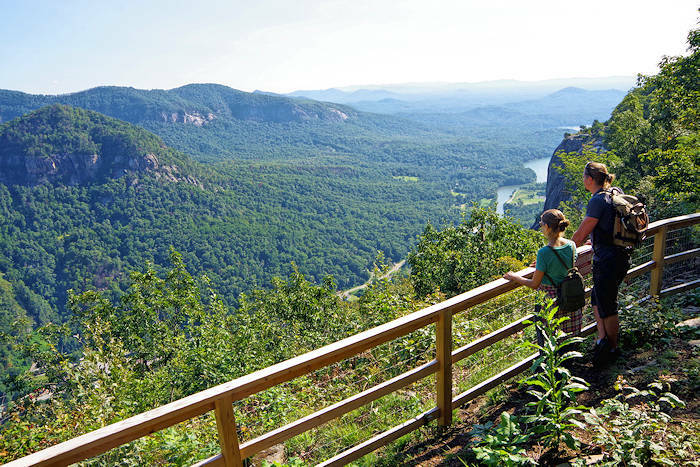 See our Chimney Rock Guide to plan a trip to the park. 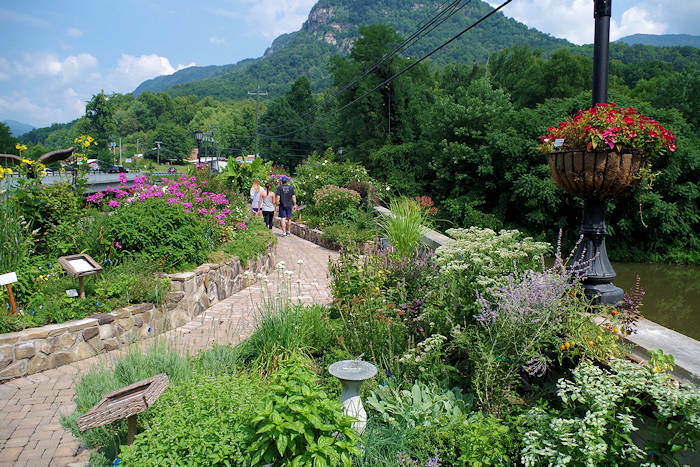 And be sure to stop in the Chimney Rock Village to browse the shops and walk the river boardwalk.